Once the grunt work of lifting and fastening drywall is done, the finer (and messier) work of finishing begins. The equipment you need for this stage includes basic tools for mixing, taping, finishing ("mudding") and sanding. Only four tools for finishing are absolutely essential: a mud pan, two drywall knives and a sander. But a few others can help the job go more smoothly, quickly and cleanly. A couple of drywall knives are essential to finishing drywall. A mixing paddle attaches to a power drill and makes quick work of mixing drywall compound, or "mud," in preparation for taping and finishing the drywall. Mixing the compound, which is recommended even with premixed products, ensures a smooth consistency and helps remove lumps. A small mixing paddle suitable for a standard 3/8-inch drill is best for DIYers, while pros use larger paddles and drive them with 1/2-inch drills for more power. A mud pan holds a workable amount of compound and makes it easy to load mud onto your drywall knife. Once you've filled the pan about halfway with fresh mud, you hold the pan in one hand and the drywall knife in the other; dip the knife into the pan to scoop up some mud, then scrape off the backside of the knife on the edge of the pan so the knife is nice and clean (minimizing drips). When it's time to reload the knife, scrape off both sides on the pan's edge, then scoop up more mud. Mud pans come in metal and plastic, but metal is better. Some pros use a traditional mortar hawk in place of a mud pan, simply out of preference. Mud pan for drywall compound. Taping knives are the smallest drywall knives and are used to apply the first layer of mud to drywall seams, or joints. When taping joints with paper joint tape, you apply a band of mud over the joint (using the knife), lay the tape over the mud, then press and smooth the tape into the mud, again with the taping knife. When using mesh tape, stick the tape directly onto the drywall seam then mud over it with the taping knife. A taping knife, particularly a 6-inch knife, is also used for mudding corner bead (angle pieces that cover outside corners) as well as finishing the ends of walls, such as those flanking wall openings. A 6-inch knife is more versatile than smaller versions (such as 4-inch). Larger knives—usually 10-inch and/or 12-inch—are used for the second and subsequent finishing coats after the taping coat. Compared to a 12-inch knife, the narrower size of a 10-inch makes it a bit easier to work with, and some beginners prefer a 10-inch for the second coat as well as for the final finishing coats. However, a 12-inch knife works just fine for the second coat and is better for the final coats, so if you just want the essentials, get a 6-inch and a 12-inch. A 12-inch knife has a relatively flexible blade that allows you to bend the knife to "feather" the final coats of mud. Feathering creates a gradual transition from the center of the mudded joint (the thickest area of mud) to the bare drywall at either side of the joint. Applying more pressure to the outside edge of the joint, and thereby flexing the blade at the outside edge, make the mud thinner at the outside than the inside. This technique is easiest to do with a 12-inch knife. Corner trowels smooth both sides of an inside corner at the same time. This is an optional tool but can be worth it when there are a lot of inside corners to tackle. The alternative is using standard taping and finishing knives to finish each side of the corner separately; and it can be tricky to smooth one side of the corner without scraping the edge of the knife onto the adjacent side. Professional drywallers use banjos (or similar tools) for quickly taping and mudding joints. A banjo is like a big tape dispenser that loads paper tape with mud as you pull the tape out of the banjo. It's a simple tool but takes some practice to use effectively, so it won't save much time on most DIY-size projects. 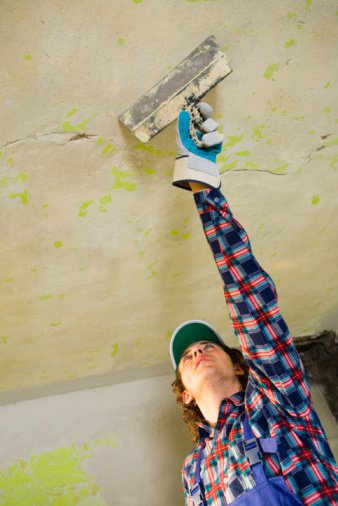 Drywall joints are sanded between the second, third and subsequent coats of mud to remove bumps and other imperfections from the dried compound. For small DIY projects, the simplest tool for sanding is a sanding sponge_—a disposable sponge with a sandpaper-like surface. For larger projects, a better tool is a _hand sander, which uses replaceable abrasive sanding screens. Hand sanders are faster than sponges, and you can replace the screens as they wear out, without having to replace the sander tool. Pole sanders use replaceable screens (like a hand sander) and have a pivoting head and a long wooden pole to let you sand up and down walls (and even ceilings) quickly and without a ladder. Pros do most of their sanding with a sanding pole (if not using some type of power sander). Poles also make sense for large DIY projects since most drywall jobs involving ceilings. Not long ago, only pros had vacuum equipment for drywall sanding, which eliminates most of the horrible dust created by sanding. But these days, DIYers can buy inexpensive sander attachments for shop vacuums. Some attachments have a hand sander, and some have pole-type sanders, but all attach to a standard shop vac for home use. Drywall dust is extremely fine, so it's best to use a shop vac with a bag and filter, to help capture all the dust.